Comics Make Me Happy! : Nostalgia: Good or Bad for the Comics Industry? Nostalgia: Good or Bad for the Comics Industry? One thing I'm learning as I read more about comics and read more from comics fans is this issue of nostalgia. Apparently, once a writer makes it in the industry, he or she will writer stories featuring characters that they grew up with. Some readers seem to think this is a bad thing, while others still clamor for the "good old days," whatever that may be. Those fans in the anti-nostalgia camp seem to think it stagnates the art of comics--perhaps they wonder how can something progress when you're looking back? While the pro-nostalgia comic fans (and I think I fall more towards this line of thinking...even though I don't see how I can legitimately be nostalgic after eighteen months of comic reading) yearn for storytelling throwbacks of an earlier era. All of this raises all sorts of issues for both camps. How do you decide which era is the era which deserves an homage? How can you expect someone to read a story which isn't original without becoming bored of it? And so on. I can't really answer those questions, only raise them. Because some characters have been around for over a half a century, and so many hundreds of stories have been written about them, there's so much to pick from when it comes to finding the "ideal" era to re-create. And because we all have different tastes, who is to say what's best for a particular character? The industry can go by numbers, I guess, and see what sold well and what was popular, which is I think are part of the motivation behind Justice League: Generation Lost. (Or, at least, I suspect it is.) I'm all about doing things for the love of it and not the money, so all of this revisiting-the-past seems a bit like cashing in. So, I think, in small doses (and when done right), a little nostalgia is a good thing. What I find really weird, though, is that my generation--the current generation of young adults--has suddenly become so nostalgic. That's something I'll have to look at in a future post. Now you know the real reason why Booster ditched the collar. Yeah, I really enjoyed that issue too. You know, I read comics in the eighties/90's, but never at length, and JLI I only read a out of the quarter bins a few years ago. I look at the current swing less as nostalgia, and more as a push towards things that worked. The silver age "True" heroes worked, with all their role model-y, fun adventures. Brightest Day/rebirth(s)/secret origin, seems like a return to that. The less serious take of the JLI worked, giving a more dynamic, realistic take on interpersonal relationships. After all, exceptional people tend to be hilarious in my experience. Booster Gold (both pre Giffen and current), doom patrol, Secret Six, heck, Batman and Robin all seem to be in that vein of Good character developement, fun action, and occasional gravitas to make everything that much sweeter. I think of it less as backtracking, and more as a refining. Exclamation points are awesome, especially Martian ones. I hope you're right, mathematicscore, and this trend that you and Liss see is about emphasizing certain basic storytelling virtues that have been neglected in recent super-hero comics, and not about nostalgia, because if it is nostalgia, that means the publishers have simply given up on attracting new readers. Okay, I loved JLI... from about the seventh issue until around #40. I liked Justice League Europe at times. One hit a major slump and never fully recovered, while the other spent most of its run there. I can do this with most any series I've ever dug, and even some I mostly hated. Few titles are evergreen, and most falter before crossing the finish line. I think both of the Super-Buddies/Formerly Known stories were pretty swell, but not because they slavishly recreated the old stories. It was because they got the creative band back together, and the guys approached the material with enthusiasm. Further, the books were at their worst when trying to replicate the original stories (especially the Vaudevillian shtick,) and at its best when creating new dynamics or addressing interim changes (Fire & Guy's Orpheus tragedy; Guy's creepy flirtation with Mary Marvel.) Personally, I enjoyed the same team's work on The Defenders mini-series better than the DC reunion. Now, the thing is, the JLI reunion mini-series sold rather well. Certainly good enough for the follow-up not to be dumped into a JLA: Classified arc. This was because it conflicted with Identity Crisis and DC's editorial mandates. The sales of one book didn't factor into the Grand Plan of maladjusted fanboy creators who've spent the past decade alienating chunks of DC's ever dwindling fan base. People want to read good stories featuring characters they like. That's no more nostalgic than my wanting to see a new Robert Downey Jr. movie because I enjoyed his work in older flicks. I don't want to see RDJ in some crappy Oscar grab about a homeless musician any more than a want Sue Dibny raped and murdered. Give me Iron Man, and give me more quality scripts from Giffen & DeMatteis. I'm not nostalgic-- I just don't want to buy offensive crap. So it seems that you're all in consensus that what some people call nostalgia is really just good old solid storytelling combined with accurate interpretations of beloved characters. It seems like a simple formula to follow. How come we all get it and DC doesn't? I just don't get why comics can't be simple and fun and for the people rather than meet an industry standard. It reminds me of the intellectual stagnation of academia where professors just run around arguing minutiae or the "let's write music only scholars will enjoy instead of writing for the masses" credo that killed classical music (and possibly art, too.) But I digress. I really do miss those letter columns that used to be at the back of comics. (Okay, I know I wasn't reading comics when those were around, but still.) There seems to be a disconnect between the industry and the fans, and the elimination of the letter columns is so telling of where the company's priorities lie. In the end, you've got to make your readers happy, and editorial mandates can't save you from people not wanting to buy your books. I liked the Formerly Known series as well, the the Orpheus story was a high point. 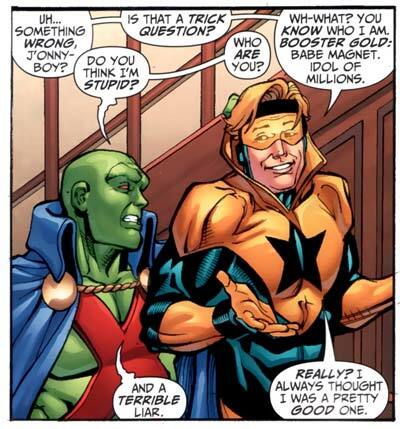 Though Booster marrying an old rich lady I found to be just a bit much...until Giffen and DeMatteis totally redeemed themselves by saying that was a practical joke in a recent Booster Gold issue. Stunts, gimmicks and "events" are easier to do than good stories. So long as DC and Marvel can make money the easy way, they will. I don't think it's entirely nostalgia. Part of what drives "nostalgia" is the discovery thing -- that is, when people discover what certain characters were like PRIOR to their own personal experiences or "time periods." I remember when I first discovered the original Batman stories -- that is, the ones that predate ROBIN -- from the early, early 1940s. At the time, the only comic book Batman I'd known was the Neal Adams/Denny O'Neil Batman. Wow. I couldn't get enough of those old, old Batman stories -- and, sadly, there were many done. When I was a kid in the 1970s, other kids at the time were obsessed with the 1950s. Throughout the 2000s (so far), kids have been obsessed with the 1980s. It's not nostalgia -- it's discovery. Sea of Green makes a good point that I'll warp for my own ends. In the instance stated, discovering how good Finger/Robinson Batman stories are, or in my case digging the original Siegel & Shuster Superman, is one thing. What happens when you like a version of a character like the modern take on Ghost Rider, then discover the '90s version wasn't all that different, but you continue to disregard the '70s original? Is that nostalgia, or just an extension of the taste that later writers developed? Are you any more right or wrong for embracing a specific interpretation of a character? Liss, you make a good point about academic navel gazing, but that knife cuts both ways. What about the guy who still gripes about the liberties Frank Miller took with Daredevil, a poor man's Spider-Man and hanger-on for a couple of decades before being reinvented as a pulp detective super-hero? One person's "right" take on a character is another's stagnation. I'm looking at a picture of a version of Booster Gold that changed massively from his original conception as a solo character, and a version of the Martian Manhunter that would had gone far astray from Miller/Certa? With the internet, I think there's more of a direct line amongst fans and to creators than ever before. Where the system breaks down is that fanboys are now the ones writing the comics, and instead of trying to please an audience, serve an editor, or explore their craft, they just bash out fan fiction until they're adored or stopped. This isn't art, just unprofessional publishers greenlighting vanity projects for a niche audience. BTW, the "Formerly" series were at one point tossed out of continuity, so I'm glad Booster's jacking with time has brought them back in. Martian Manhunter: Blank Canvas for Symbols, Too?